Dorothy Dougherty, Deputy Assistant Secretary of Labor for OSHA, was recognized for her years of public service last week when she received the prestigious Roger W. Jones Award for Executive Leadership at the American University School of Public Affairs. 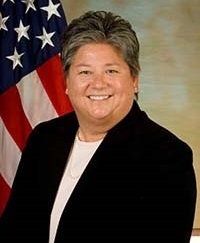 Dougherty became OSHA's Deputy Assistant Secretary in January 2014 following 22 years with the agency, including roles as Director of Standards and Guidance, Deputy Director of Technical Support, and Executive Assistant for the OSHA Assistant Secretary. Before joining OSHA, she served for several years in the Mine Safety and Health Administration as an Industrial Hygienist and Coal Mine Inspector. She graduated Old Dominion University with a Bachelor of Science degree in Environmental Health, and also holds a Master of Science degree in Safety from Marshall University. Since 1978, American University has honored more than 70 federal career executives in SES positions for their exceptional public service and dedication to the work and goals of government. Each year a panel selects two individuals for their demonstrated capabilities in the areas of leadership and commitment to effective continuity of government. The award was named for Roger W. Jones, a federal civil servant who helped direct the Office of Management and Budget in the 1940s and 1950s. OSHA has cited another Dollar General store for safety violations. The agency inspected a Jonestown, Pa., store after receiving an employee complaint. Violations included an emergency exit door barricaded with a metal bar, blocked electrical panels and an obstructed path to an emergency door. Proposed fines total $215,578. "Dollar General continues its pattern of failing to maintain safe exit routes at its stores," said Dave Olah, area director of OSHA's Harrisburg Area Office. "Despite receiving more than 100 safety and health violations at stores nationwide since 2010, which carried more than $1 million in proposed fines, the company has still failed to take corrective actions." Read the news brief for more information. A safety complaint filed against Ridge Corporation resulted in an OSHA inspection of the company's Pataskala, Ohio, facility where thermoplastic lining systems for truck bodies and trailers are manufactured. Inspectors found Ridge exposed workers to amputations and other serious injuries by disabling safety devices to speed production. Other violations included failing to: install machine guards on equipment; remove defective forklifts from service; and cover exposed electrical connections. The company was cited for 10 safety violations and proposed penalties of $214,857. Read the news release for more information. Since 2011 OSHA has cited Central Florida contractor Collis Roofing for willful, repeated and serious workplace safety and health violations. Most recently, inspectors found the company exposing its workers to dangerous falls as they installed shingles at a residence in Deland, Fla. The company failed to protect workers with a fall protection system, allowed employees to operate powered nail guns without eye protection, and allowed unsafe use of a ladder. Collis was cited for two repeat violations and one serious violation, resulting in proposed penalties of $142,865. For details, see the news release. Two workers at PECOFacet, a global manufacturer of filtration and containment products, suffered serious injuries when metal plates fell on them. One worker-in-training had his finger amputated and another worker suffered serious injuries to his feet in separate incidents. OSHA cited the Mineral Wells, Texas, company with 21 serious violations that included allowing workers to operate machinery without safety guards and emergency stop switches; using non-compliant crane equipment; failing to install guard rails on elevated surfaces; and failing to address electrical hazards. Proposed fines total $224,477. For more information, read the news release. A pipefitter at a Hudson, S.D., ethanol refinery plant died from burns when ethanol from a process pipe spilled on him and was ignited by flames from nearby welding operations. OSHA issued five serious safety violations to his employer, Bilfinger-Westcon, the construction contractor, for allowing welding work to occur without verifying that the area was free of flammable liquids. The agency also cited Sioux River Ethanol LLC, the refinery owner and operator, for three serious violations of OSHA’s process safety management standards. Other violations include failing to provide flame-retardant clothing and failing to train workers on hazards related to ethanol processing. Bilfinger-Westcon and Sioux River Ethanol were proposed penalties of $62,355 and $37,413, respectively. Read the news release for more information. The following are recent examples of enforcement cases from state occupational safety and health programs. 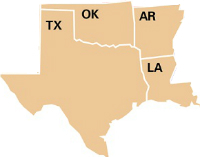 For more examples of state and federal enforcement cases, visit OSHA's online enforcement penalties map. The Washington Division of Occupational Safety and Health fined American Disaster Services Inc. in Kirkland $87,000 in penalties for exposing workers and others to cancer-causing asbestos at Seattle area worksites. Inspectors determined that the company failed to remove a substantial amount of asbestos from the basement floor of a Seattle residence, failed to perform personal air-sample monitoring of workers during asbestos removal activities and did not file accurate notices or notify Washington DOSH of future asbestos removal projects. For more information, see the news release. Oregon OSHA fined TC Excavating LLC in Estacada $142,800 following a trench collapse that resulted in the death of a worker. Inspectors concluded that the company failed to properly shore the trench, or provide an adequate system to protect workers from cave-ins and ladder or other safe means to exit the trench. For more information, see the news release. Please visit the enforcement news releases page for more on OSHA enforcement activity. OSHA will offer free training Dec. 16 in Stow, Mass., on Fall Protection in Residential Construction-Complying with the OSHA Regulation. The training will help employers implement effective fall protection on their residential construction sites. Three additional sessions are scheduled from March through September 2017. For more information, read the event flier. In response to a consistently high number of workplace amputations in Arkansas, OSHA's Little Rock Area Office worked with other organizations to hold its second annual Arkansas Amputation Prevention Stand-Down. From September 14-29, OSHA and the Arkansas Department of Labor helped facilitate and support individual stand-down events held by companies in Arkansas and other states to train workers to recognize, mitigate and eliminate amputation hazards. More than 60 people attended the Sept. 12 kick-off event, which featured several testimonials of persons who had suffered workplace amputations and was streamed online by the OSHA Education Center at the University of Texas at Arlington. By the end of the two-week Stand-Down, more than 9,000 people received amputation awareness training, potentially removing 4,000 workers from amputation hazards. The Virginia Occupational Safety and Health Program and the Associated General Contractors of Virginia signed an agreement to promote safety and health and reduce injuries, illnesses and fatal incidents on construction worksites in the state. The Virginia BEST Program, Building Excellence in Safety Health and Training, encourages and recognizes AGC members who implement highly effective safety and health programs to protect construction workers. For more information, see the news release. Automation & Electronics Inc., an industrial electrical design-build contractor, contacted OSHA's On-Site Consultation Program to strengthen the existing safety culture at its facility in Casper, Wyo. Working with OSHA consultants, the company created a safety committee made up of employees from all departments, and implemented job safety analysis policies, company-wide incident reviews and a web-based platform that all employees can access to obtain safety documents and policies. During their 16 years of participation in OSHA's Safety and Health Achievement Recognition Program, the company has reduced injury and illness rates, lowered insurance costs, and increased production. For more information, see the success story. 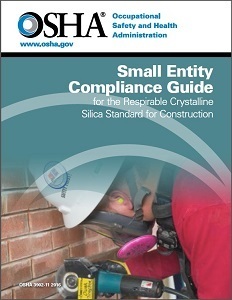 OSHA has released a Small Entity Compliance Guide for Construction that is intended to help small business employers comply with the agency's Final Rule to Protect Workers from Exposure to Respirable Crystalline Silica. The guide describes in easy-to-understand language the steps that employers are required to take to protect employees in construction from the hazards associated with silica exposure. All covered must: provide respiratory protection when required; restrict silica exposure from housekeeping practices where feasible; implement a written exposure control plan; offer medical exams to workers who will need to wear a respirator for 30 or more days a year; communicate hazards and train employees; and keep records of medical examinations. Enforcement of the final rule in construction is due to begin June 23, 2017. A new hazard alert explains how to prevent fatalities associated with hot work on oilfield tanks, tankers, and related equipment. 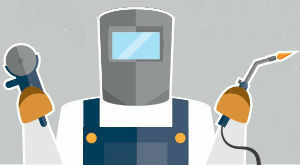 Hot work can include burning, welding, and using fire- or spark-producing tools. From 2005 to 2015, fires or explosions caused by hot work in oil and gas exploration and production operations took the lives of 28 workers. The alert describes potential hazards and outlines what employers must do to protect workers. This includes conducting exposure and hazard assessments, establishing safety procedures, monitoring for flammable gases and vapors, and providing training. A key message in the hazard alert for employers and workers is to never assume that an empty tank is a safe tank – "check every tank every time." The hazard alert is available from the National Service, Transmission, Exploration and Production Safety Network. It was developed through OSHA's alliance with the National STEPS Network and the National Institute for Occupational Safety and Health. Thanks for following and retweeting! 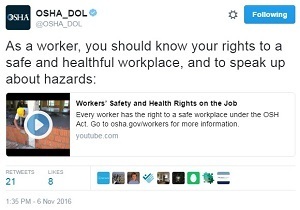 Continue following @OSHA_DOL on Twitter and visiting the DOL Facebook page for up-to-the-minute OSHA information and resources. Are you interested in a career with the Department of Labor? DOL has job opportunities throughout the country. QuickTakes is emailed free twice monthly to more than 155,000 subscribers. You can receive it faster and easier by subscribing to the RSS feed that delivers almost instant information. Visit OSHA's RSS Feeds Web page to subscribe.